All Sugar Loaf homes currently listed for sale in Sugar Loaf as of 04/24/2019 are shown below. You can change the search criteria at any time by pressing the 'Change Search' button below. If you have any questions or you would like more information about any Sugar Loaf homes for sale or other Sugar Loaf real estate, please contact us and one of our knowledgeable Sugar Loaf REALTORS® would be pleased to assist you. "LOOKING FOR AN AMAZING ONE OF A KIND LOG MASTERPIECE? LOOK NO FURTHER. THIS CUSTOM HOME BOASTS 16 INCH FULL LOG CONSTRUCTION WITH GRAND CATHEDRAL CEILINGS IN THE GREAT ROOM. GRANITE AND TRAVERTINE FINISHES IN MUCH OF THE HOME. STAINLESS STEEL APPLIANCES, CUSTOM WINDOW COVERINGS & TOP OF THE LINE ENGINEERED HARDWOOD FLOORING. ENJOY FUN TIMES / MAKING MEMORIES WITH FRIENDS AND FAMILY IN THE GAME ROOM / LOFT AREA. WRAP AROUND DECKING WITH NEW SPA TO RELAX AND ENJOY THE BIG BEAR VALLEY. THIS IS ONE OF THE FEW HOMES IN THE AREA WITH CENTRAL AIR CONDITIONING." "This is a ONE OF A KIND cabin secluded and nestled against the forest! Perfect for hiking and enjoying nature. Its architectural design, with wood beams and atrium ceiling will WOW any buyer. It also includes a creek that runs through the property, level parking, rock fireplace, NEST thermostat, 4th bedroom/game room, upper bedroom master suite with private deck and comes completely furnished! Don't pass this one up! *More pics to come!" "Ready to enjoy! This beautiful updated Sugarloaf home exudes affordable luxury and pride of ownership. With 3 bedrooms (including two Master Suites), 3 baths & 1,756 sf of living space - this property has plenty of room for everyone. As you enter, you will find an open floor plan sharply appointed with maple style engineered floors, granite counters, stainless steel appliances and painted cabinets. The bottom floor includes the living room, kitchen, washer/dryer closet, plus storage/pantry room and a Master Suite - leading to a small rear deck to enjoy the outdoors! On the second floor is a family/bonus room (could be used as an office) along with another Master Suite, front balcony, third bedroom and bath. All bedrooms and upstairs (except bathrooms) are carpeted with a nice neutral color. Remodeled and expanded in 2012 with permits. Excellent vacation investment property or permanent rental." 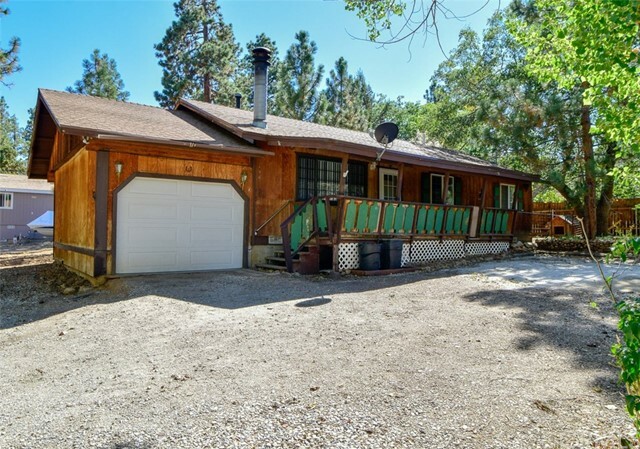 "4 BEDROOM, 2 BATH LARGE KITCHEN AND DINETTE W/ SOLID GRANITE COUNTERTOPS AND BREAKFAST BAR. LIVING ROOM HAS FIREPLACE WITH REAL LOG MANTEL. T & G IN DINETTE, LIVING ROOM AND 2ND FLOOR CEILING.. 1 BEDROOM AND BATH DOWNSTAIRS. BIG LAUNDRY AND MUDROOM W/ REAR DOOR ACCESS AND CABINETS AND TILE FLOOR. NEW CARPETING! FRESHLY PAINTED! BATHROOMS HAVE TILE FLOOR, GRANITE TOPS, MAPLE CABINETS. CEILING FANS THROUGHOUT. SOLID PINE INTERIOR DOORS. LOTS OF STORAGE FOR SUMMER AND WINTER TOYS. GOOD SIZED BACKYARD THAT'S FULLY FENCED TOO!" "JUST BRING YOUR TOOTHBRUSH. 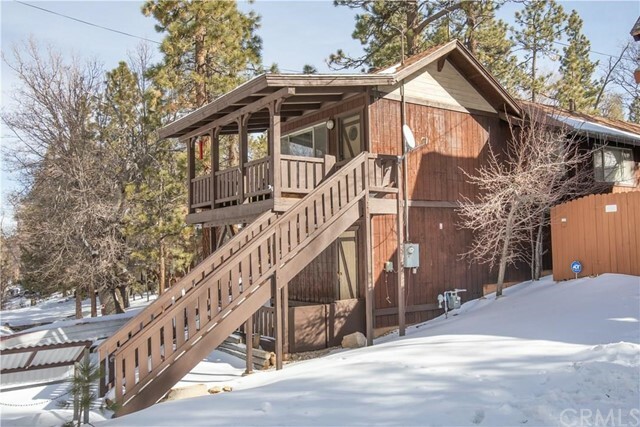 ONE OF THE CLEANEST, BRIGHTEST CHALET-STYLE CABINS YOU WILL FIND AT THIS PRICE. THE OPEN FLOOR PLAN IS GREAT FOR ENTERTAINING LOTS OF GUESTS OR RELATIVES. THE KITCHEN HAS BEAUTIFUL CABINETRY AND PLENTY OF COUNTERTOP AREA TO PREPARE AND SERVE HEARTY MOUNTAIN FARE. EVERY WINDOW THAT YOU GAZE OUT FROM HAS A VIEW OF THE SURROUNDING PINE TREES. THE CABIN IS QUIET AND NOT FAR FROM THE NATIONAL FOREST. THE HOME HAS BEEN KEPT IN TIP-TOP SHAPE WITH BRAND NEW CARPET AND EXTERIOR STAIN. THE GORGEOUS ROCK FIREPLACE IS DEFINITELY A FOCAL POINT. JUST IMAGINE GATHERING AROUND IT DURING THE HOLIDAYS AND LISTENING TO THE CRACKLING FIRE. ENJOY THE PRIVATE HOT TUB UNDER THE STARS AFTER A LONG DAY ON THE SLOPES. 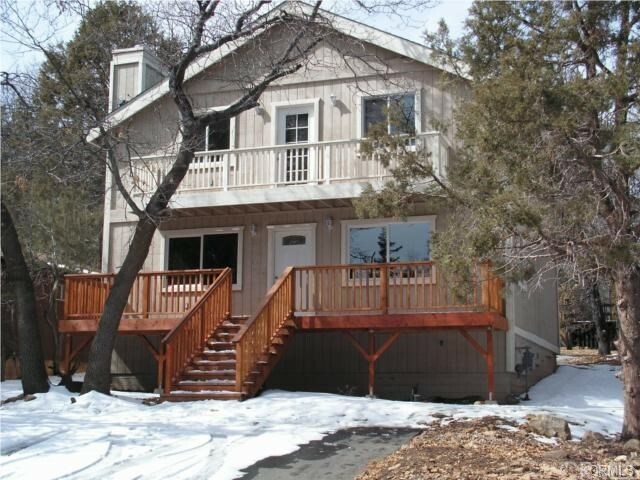 YOU WONT WANT TO MISS THIS FANTASTIC BUY IN THE BEAUTIFUL SUGARLOAF AREA OF BIG BEAR VALLEY." 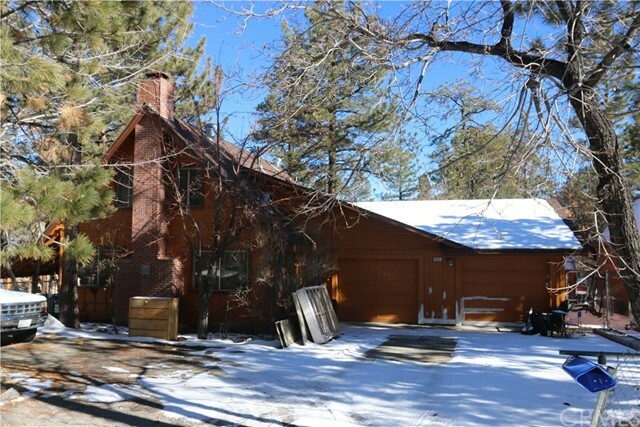 "Mountain Home located on multiple lots and backing acreage properties property close to National Forest. 3 bedroom 2 bath with 2 car garage. Fenced yards. Massive Rock fireplace in Living Room. Granite Countertops. Knotty Pine Interior and Wood Flooring. Woodsy Mountain Feel Home. 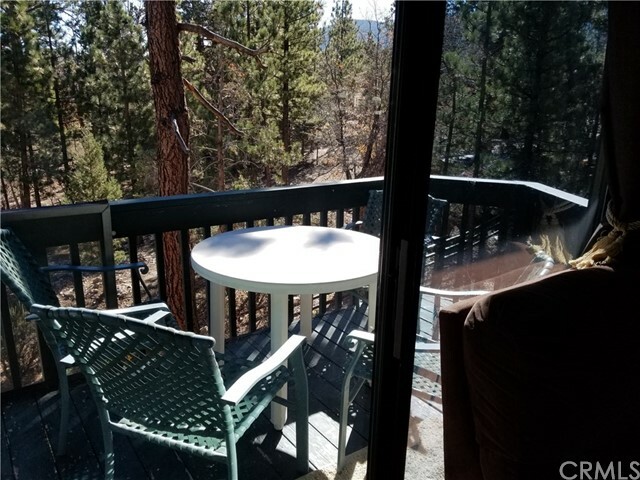 Decks and Balcony in rear off Upstairs Bedroom Viewing Trees and Open area. Walk to Local Restaurant, Store and Post Office or Hiking Trails. Skiing and Lake Activities are a close 10 Minute drive." 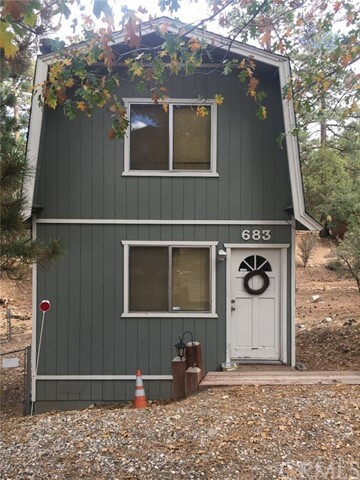 "You will love this perfect mountain getaway located on an extra large corner lot, nestled amongst several mature pine trees. 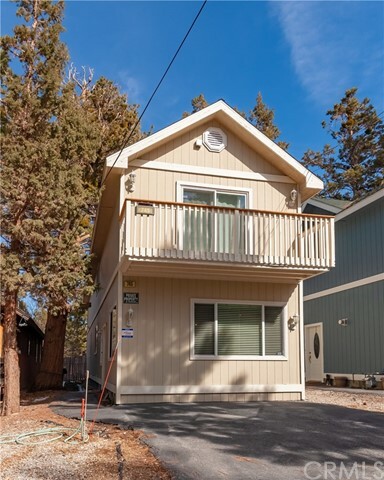 Experience premium mountain living only minutes from Snow Summit, Bear Mountain, Big Bear Village, and the lake. 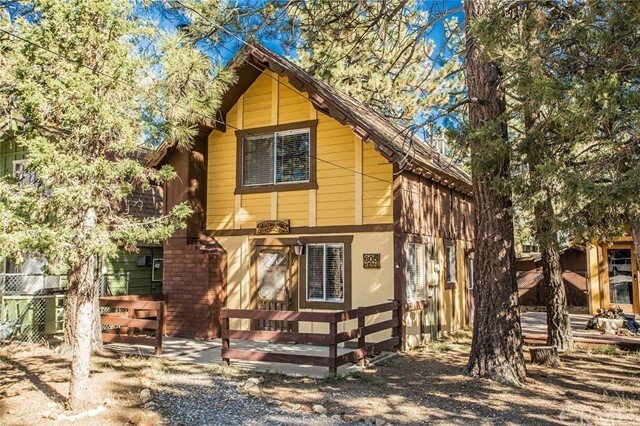 This mountain cabin has been completely remodeled and is move-in ready. 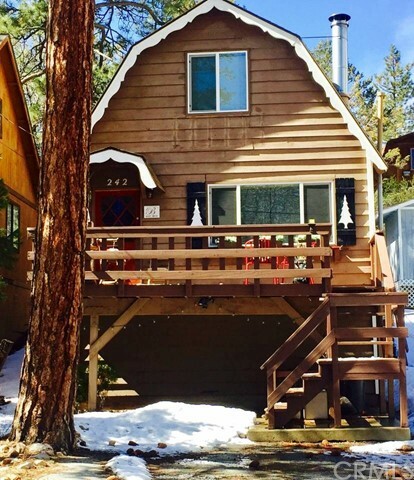 Come fall in love with the quiet and pristine beauty that Big Bear has to offer." "Don't let this one pass you by. Custom home built in 2003 and recently updated. Lots of natural light and earth tones. Cozy river rock, gas fireplace and raised hearth. Large open kitchen with granite counters, center island with breakfast bar. Additional upgrades include recessed lighting, wet bar, upgraded flooring. This home also offers 3 large bedrooms, full bathrooms and a powder room. Large master with mirrored wardrobes and walk in closet. Two decks front an back with fenced yard and storage shed. 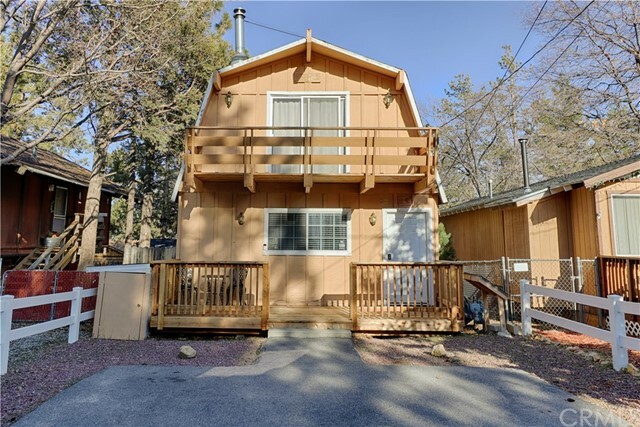 Close to everything Big Bear has to offer." "Wonderful setting on this 3 bedroom 2 bathroom home on a corner lot in Sugarloaf. Kitchen is updated with Quartz Countertops and LED Lighting. The home will come furnished making it easy to be a rental or 2nd home. Has been a great rental property." "Wow this lot size is almost unheard of in Sugarloaf at 15,000 sq feet! Room to do just about anything your heart desires. Cabin sits level with street. Enter through a wonderful spacious front deck. 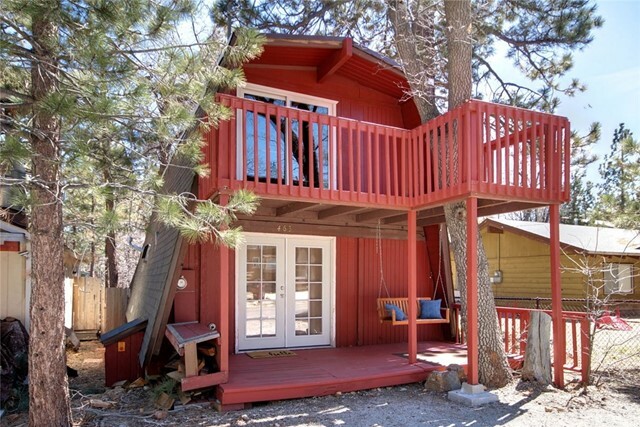 This Cabin is adorable and equipped with its own washer dryer hookups inside. Huge fireplace to warm your heart on cold winter snow days. Full bathroom and a nice sized and open kitchen with a gas stove, mini fridge and sink. Back deck is in process of a rebuild. Behind the cabin is a nice little work shed for storage or workspace." "What a sweet Gambrel in Sugarloaf. Flat parking with a paved driveway greets you on your drive into the property. No dirt or gravel here! My favorite part about this property is the finished back yard. Ready for kid (or adult) play this home has a wonderful covered back patio over looking the play area. As you walk in the front door you will love the neutral interior ready for your personalized touches. Wood flooring throughout, a wonderful wood stove, kitchen has a double sink, dishwasher, fridge, microwave, gas stove, and tons of added windows for light, and downstairs full bathroom and a stackable washer dryer set. All three bedrooms upstairs are of good size. Main bedroom upstairs also has its own patio! Property comes fully furnished." "Very well maintained Oregon Log Cabin assembled by John Penn. This cabin features original hardwood floors throughout, high beam ceilings in every room, beautifully maintained log interior, dutch front and back entry doors, recently restyled slate tile fireplace, electric floor-level heaters in every room, white lace curtains, the roof was replaced about 5 years ago and is located on a flat spacious approximately 5000 SqFt lot. Don't miss this opportunity to view and buy this original log cabin which has been priced to sell quickly." "Just steps to the National Forest. Located towards the top of quiet dead-end street with freshly painted exterior. Decks and balcony off front and back with good parking. Perfect for full-time or vacation living: Dual-pane windows, 2 large bedrooms with vaulted wood ceilings and bathroom upstairs. Living, kitchen, cozy fireplace and additional bathroom downstairs. Good sq/ft and ready to enjoy. Make sure this one is on your list to see." "Great setting for this single story home with attached garage on an oversized, nicely treed lot. 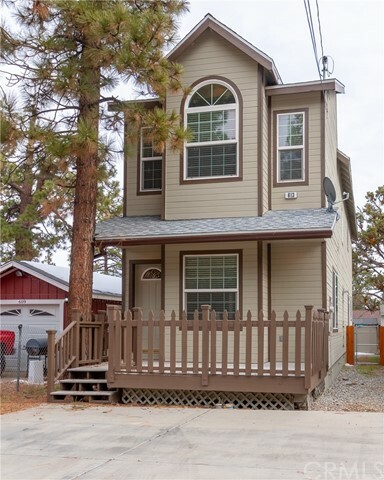 Spacious open floor plan with new carpet and interior paint, rock fireplace, dishwasher, separate laundry room, central forced heat, dual pane windows. 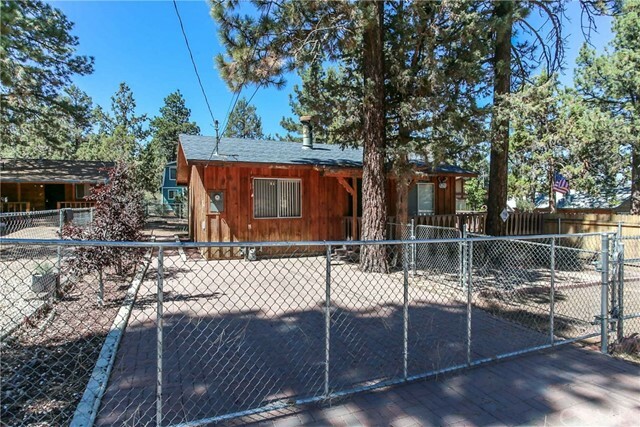 Large covered front deck, fenced back yard with storage shed, level lot with beautiful oak tree and lilac bushes, and plenty of parking for boat, RV or ? Extra built-in overhead storage space in large one car garage. 1900 sq.ft was added to parcel after County abandoned adjacent road on right side of property, making lot size a total of 6900 sq.ft. This 3 bed, 1.5 bath home needs a little TLC, but it has so much to offer at this great price. Would make a great full time or investment home." 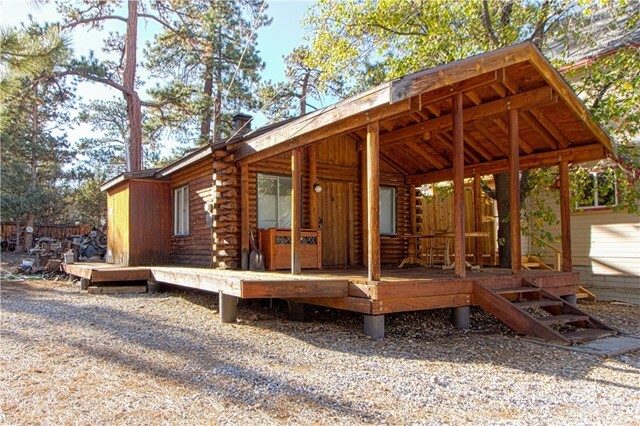 "This is a very cozy, neat vacation cabin or full time home. 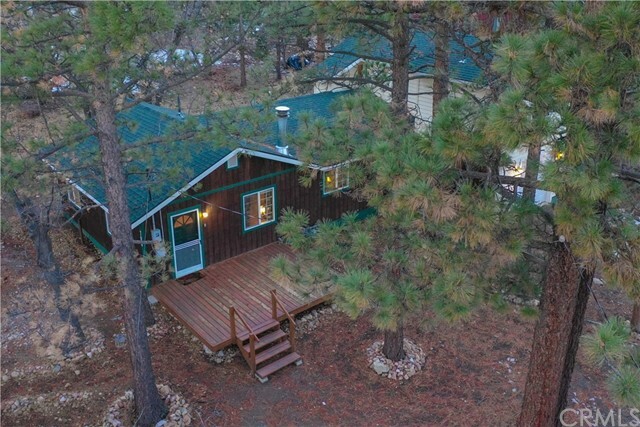 This immaculate cabin is located very close to the National Forest - approximately 700 feet. It has been recently remodeled to include all new flooring - wood laminate in the living area and carpeting on the stairway and in the bedrooms. All new window coverings. New counter tops and appliances. New bathroom. You will not find a more well maintained cabin. It is ready to enjoy and create your memories." 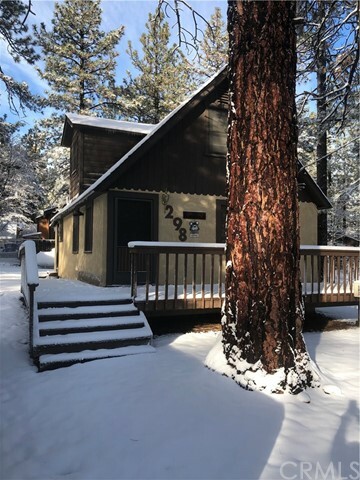 "Located a block away from the National Forest is where you'll find this two bedroom, two bath two story chalet ~ Open floor plan with living, dining and kitchen downstairs ~ Corner fireplace to keep you warm during the winter months ~ Spacious loft upstairs could be 3rd bedroom/bunk room/game area ~ Balcony off master bedroom upstairs ~ Nice level double lot with ample space to park a boat or RV ~ Excellent storage shed to store skis, sleds, bikes, and toys ~ Ready for your full time or vacation home with schools, park, and National Forest close by." "Cute little house on a large CORNER lot over 10,000 square feet! (Additional parcel) Three bedrooms (one down stairs/front upper closet in adjacent bathroom, plenty of storage) a 3/4 bath down stairs and an additional 1/2 bath up stairs, a recently REMODELED KITCHEN, a newer floor heater, a large wood deck, an attached storage room and an additional storage shed. Plenty of room for parking and expansion. Great community...close to the High school, a great neighborhood park, snow boarding, boating, fishing, restaurants, shopping and most other conveniences. A nice week-end retreat, investment property, or a small family starter home. A lot of great memories were made in this place over the years...now it's your clients turn! Hurry and make an offer...enjoy the snow while it lasts! ***13 Month Home Warranty from Old Republic Included****"
"This cute little cabin is a great opportunity to have your family Big Bear Lake retreat ~ Located on a quiet street ~ Enjoy your morning coffee on your front porch swing listening to mother nature come to life ~ 2 bedrooms, 1 bathroom and a good sized loft offers plenty of room to bring friends and family ~ Gather around the wood burning stove with stone tile hearth and watch the snow falling outside ~ Wood grain laminate style flooring ~ Fenced yard for the kids and pets ~ Don't miss your chance!" "Two Bedroom home with FOUR LOTS, total of 10,000 square feet lot size. PLUS One and half bathrooms. Inside laundry room included washer and dryer and has half bath as well. Fully furnished. Including, kitchen appliances, living room furniture, bedroom furniture, lamps, lighting, wall hanging and decorations on walls. Upstairs bedrooms are fully furnished. Master bedroom is very spacious and has two closet/storage areas for personal belongings. Beautiful wood burning fireplace in spacious living room opens to kitchen and dining area. Large deck off of kitchen has patio furnishings and area surrounding home is fully fenced in the backyard and sideyard. Once again, note property contains 10,000 sq. ft. of land!!! A rare find in Sugarloaf. Facing the home there are two vacant lots to the left and one vacant lot to the right of the home when facing the home!!!" "Charming Rustic Wood Cabin with modern amenities. New Roof Dec 2018. Beautifully remodeled inside within the last few years. Updated Kitchen features lovely Pine Cabinets and stainless steel appliances. A few energy efficient updates are the copper plumbing, low-e windows/slider. Large stone fireplace for cozy winter nights. Beautiful high ceilings with wood beams add the feeling of more space. Updated tiled - bathroom. Smaller manageable lot size so you can enjoy your getaways without the extra maintenance! This cabin can be your private getaway! Also makes a great income property as a rental. Near schools, shops and restaurants. Neighborhood has lots of trees and streets are maintained." 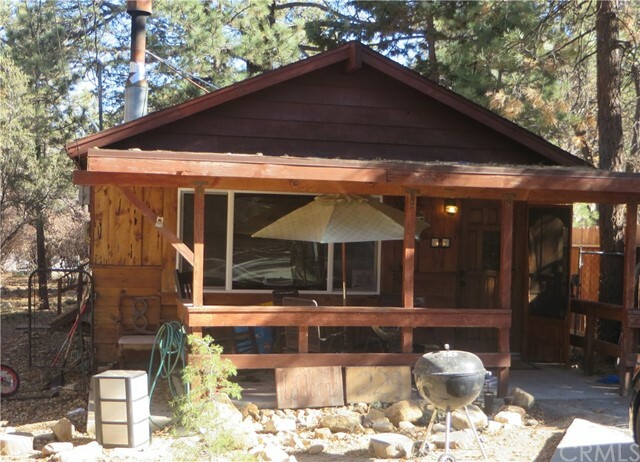 "TURN-KEY, COMPETITVELY PRICED & WELL-APPOINTED 3 BEDROOM CABIN! SELLER IS MOTIVATED & PREFERS A QUICK ESCROW! The purchase price includes all furnishings, appliances & beddings. This cozy retreat is perfect for those who love living in this environment and/or as a second home to enjoy on weekends, holidays & during particular seasons of the year. The view from the balcony in any season & the wood burning stove will surely help to relax/rejuvenate the mind, body & soul. A great environment for walking, hiking & to just get away from it all! Buyer to perform due diligence through visual inspection & professional advice regarding permitted or unpermitted space/ bedroom/bathroom count, lot size/dimensions or other information concerning the condition or features of the property. Offer to purchase must be accompanied with a pre-approval document from the mortgage lender &/or lending institution(s), FICO SCORE & proof of funds." "Brick Paved Driveway and Walkways leads to a Immaculate Home and Large wrap around Deck. Fully fenced and crossed fenced on Level grounds. Floor to ceiling Rock fireplace in charming living room. Full slider to side yard. Open and Bright Floor Plan. Single Story Tiled kitchen, Beautiful wood beamed ceilings and Vertical tiled flooring. Two large bedrooms with closets. Full Laundry and Bath. Clean and ready to show. Rear Grounds are Level and Fenced. Large Shed in Rear." 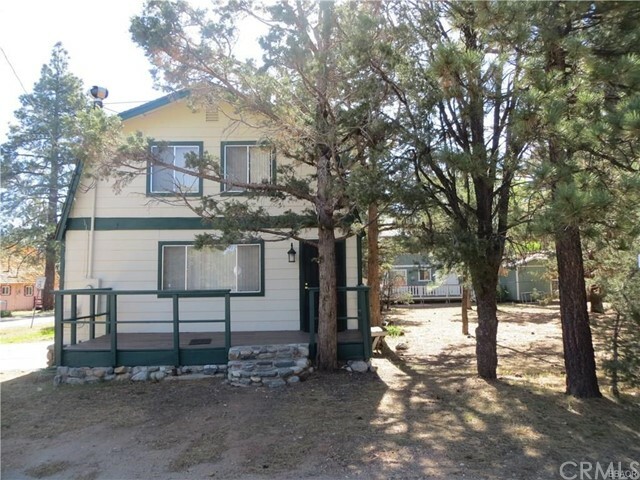 "Adorable cabin, set on a large, nicely treed level lot. 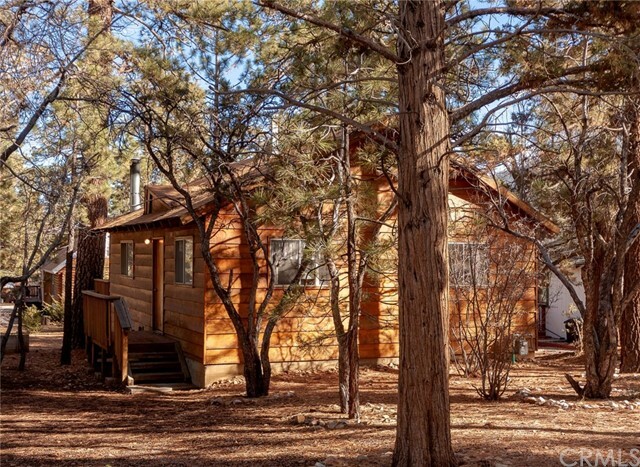 Tucked away among the trees, this little mountain home is a treasure just waiting for you to enjoy. Charming interior has nice floor plan, light and bright kitchen with laminate flooring, roomy living room, newer carpet, free standing fireplace, wood shutters on the windows. Expansive, full length back deck has been updated with composite decking - perfect for BBQing, entertaining, or just relaxing, and opens up to a spacious back yard. Plenty of room to park RV, boat or toys. Just a short distance to the Nat'l Forest. Comes furnished and ready to enjoy. 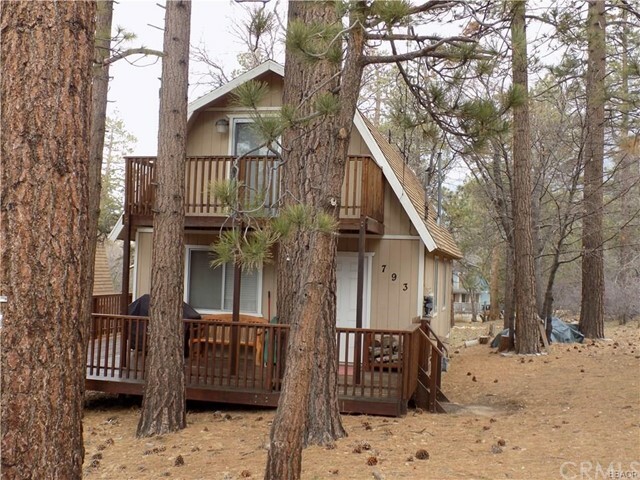 Great opportunity to start making memories at your own little cabin in the woods." "MOVE IN READY>>>>Honey LOOK ! Come sit on your deck and enjoy the fresh air and views. Its the most perfect time to invest in your getaway or your vacation rental you've been thinking about. Come upstairs and enjoy the views before going inside and sitting down on your fully furnished cabin. Watch the fire during those snow filled times or leave the screen door open and relax. Your kitchen boosts the sidebar for eating fun or kitchen table for the full sit down, yet still open to the living room. Moosey down the hall to the full bath complete with washer and dryer. Large bedrooms with big closets for all your clothes. Master bedroom has its own deck for sitting outside watching the stars. Wait there's more, the lot next door is all yours and included in the listing price. APN 2350-521-50 Total lot is 9625 sqft."